The guy at the counter wears a T-shirt that says, "I speak my mind because it hurts to bite my tongue all the time." He doesn't say a word. 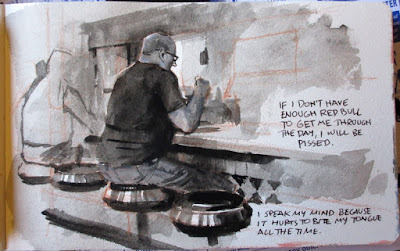 Diner Talk, gouache, 5x8 inches by James Gurney. Behind me a college girl is talking to her companions. She says, "If I don't have enough Red Bull to get me through the day, I will be pissed." She never stops talking. 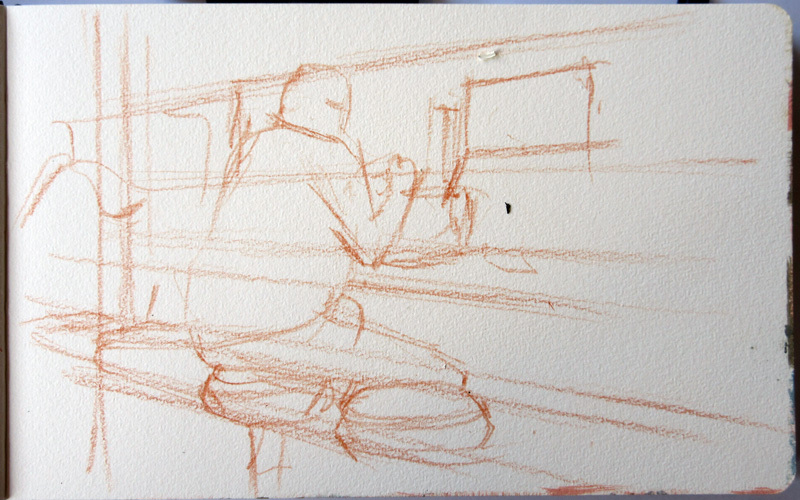 The first step in painting the scene is to place the main figure and work out the perspective of the counter, stools, and far wall. Then I paint the main guy using black gouache fairly transparently. Tip: Before you start painting someone in a restaurant, check their plate. If it's nearly empty they might not be there long. I begin to introduce some white gouache and build opacity, add detail, and correct errors. 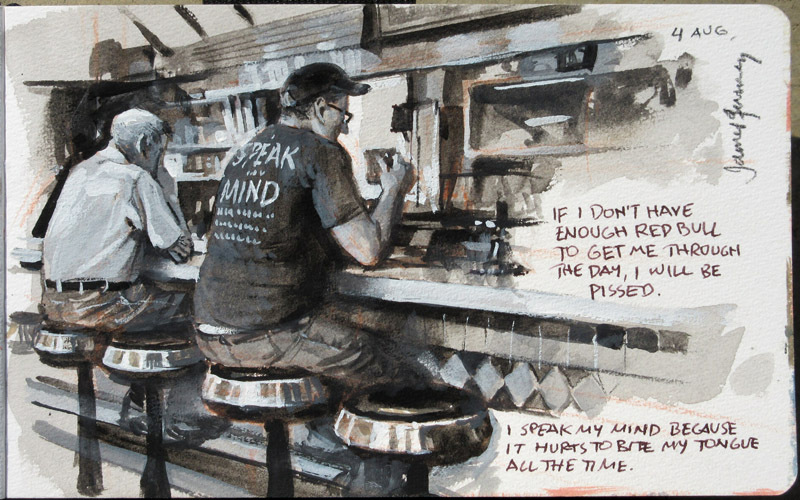 The painting is great, but what really got me this morning was the caption/description of the t-shirt guy and the Red Bull girl. Priceless. Not to give the painting short shrift though, it's another gem. I particularly love the way the russet pencil adds a second color to the black and white gouache palette. Something about two color renderings (as I think I've posted before) has resonated with me since childhood. I've always ascribed that to the mutltitude of such illustrations when I was young - in textbooks, magazines in particular and especially "kid" publications like Jack and Jill Magazine, etc. But sometimes I wonder if there isn't something more than that personal appeal to me. The simplicity maybe? 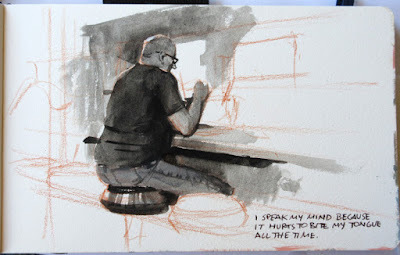 Like Tom, I've had a lifelong response to the impact of black and white -- ink drawings of E.H. Shepard, woodcuts of Albrecht Durer, scratch board images of F. Lee Jaques, wood engravings made from Dore drawings, Barry Moser's engravings -- these differ from gouache shades of gray but they share a related feel. And yes, I'd say simplicity is much of the appeal. I have a rather silly question: how do you manage to take photos of the several stages of the painting, without being noticed and becoming the epicenter of the general interest? Pardon for my english, it is not my native language. Did he move his baseball cap from his pocket to his head or did you? The composition is definitely stronger with the cap placed on his head. Glenn, good eye. I "borrowed" the hat from another diner because I changed my mind and wanted to make his head dark against light. Ο σκύλος της Βάλια Κάλντα, I have a little point-and-shoot camera that I hold up every once in a while. We had good window light, so the pictures came out OK. People at the diner and waitresses are used to us sketching there all the time. No one even seems to notice anymore. Gyrus, I don't know about that, but I always appreciate Steve's comments. I admire anyone who reads and reflects as deeply as he does. And of course I welcome any comments here on the blog and I appreciate all the unique perspectives. Steve, if you don't mind, I'll use that term organic poetry, and that's organic in the truest sense of springing up from the raw ingredients of life. A lot of rock bands have those sorts of titles, though they can be a bit rude sounding: http://brightlightsfilm.com/weirdbandnames/#.VcJIxZNVikp. Joni Mitchell song lyrics, too: "icycles and birthday clothes." I've always wanted to use the name "Spoiler Alert" on a sketchbook. Thanks, Tom, for the feedback. 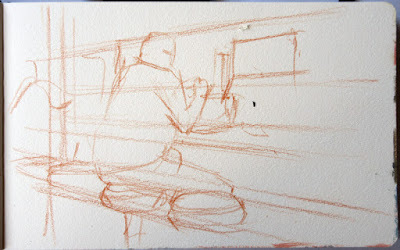 I enjoy the way the red pencil introduces a little unexpected variation into the black and white, just like putting a spritz of jalapeño sauce on the scrambled eggs. Is this using acrylagouache, I ssed to be having problems with the underlying gouache re activating. This is regular gouache. I use acrya gouache mainly for painting maquettes, but if you want a matte, opaque paint that doesn't reactivate, it's a good solution.